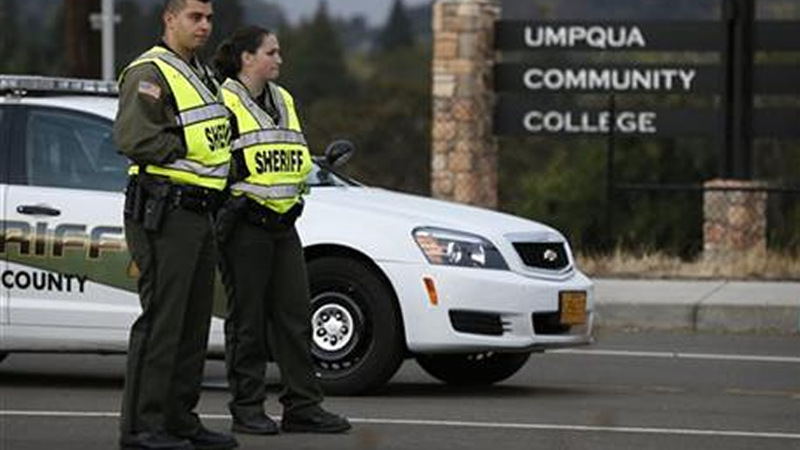 ROSEBURG, OR -- The gunman had already shot several students at close range when he stood inches from Lacey Scroggins and demanded she stand up. Scroggins could hear someone gurgling. She felt the weight of mortally wounded Treven Anspach against her, the 20-year-old's blood flowing onto her clothing. In addition to slain English professor Lawrence Levine, the dead and nine wounded were students young and old - some high school aged, others just beginning college and some starting over after a broken marriage, drug abuse or in hopes of a new career. The rural Umpqua Community College on nearly 100 acres of pastureland along the North Umpqua River has about 3,200 students in this southwestern Oregon community, where the struggling timber industry is no longer seen as a path to the future. Its website said it offered "a peaceful, safe atmosphere." The school term had just begun and Levine's 10 a.m. introductory composition class was underway when Mercer-Harper arrived on campus not with books, but with a small arsenal of weapons that included five handguns, a semi-automatic rifle, five magazines of ammunition and a flak jacket. "We heard this first BOOM," Robbins said. "About 45 seconds later we hear boom, boom, boom, boom, boom. Six shots. In the middle of that is when my instructor said, 'We have to get the hell out of here.'" Back in Snyder Hall, Lacey Scroggins didn't see her teacher fall, but Anastasia Boylan did. "She was crying and saying, 'Grandma, he killed my teacher! He killed my teacher! I saw it!" Janet Willis said, in recounting her granddaughter's story. "She hears the shooter in front say, 'You, in that orange shirt, stand up!'" Randy Scoggins said. "'What religion are you? Are you a Christian?' He says 'Yes.' She hears another pop, and she hears a thud as he drops to the ground." Rand McGowan, who was shot in the hand, told his mother it didn't seem the shooter was deliberately targeting Christians. "It was more so saying, 'You're going to be meeting your maker,' " Stephanie Salas said. "Hey blonde girl," he said, according to her grandmother. "Get up! I want to talk to you!" Mintz asked the gunman to stop, saying it was his son's birthday. The gunman opened fire again, shooting Mintz but somehow missing vital organs. Mintz lived. "He said, 'I bet you are, but it's not enough.' And with that, he shot her," Randy Scroggins said as he began to cry. Perhaps in a reference to the afterlife, he announced: "Don't anybody worry. We will all be together in just a moment," Scroggins said. "Rand was like, 'Oh my goodness,' and said 'Thank you Lord! My phone was on vibrate,'" his mother, Salas, said. "If it had rang, he would have been picked out." Harper-Mercer singled out a "lucky one" that he wouldn't kill and directed him to stand in the corner of the classroom to deliver something to law enforcement, according to Bonnie Schaan, the mother of Cheyeanne Fitzgerald, 16, who was seriously wounded and had a kidney removed. "You got me. I've had enough. I quit," her father recounted.